It looks modern, and therefore out of character with the surrounding battlements. The armies of Louis XIV of France burned the fortress in 1689 and for 200 years it was left abandoned. 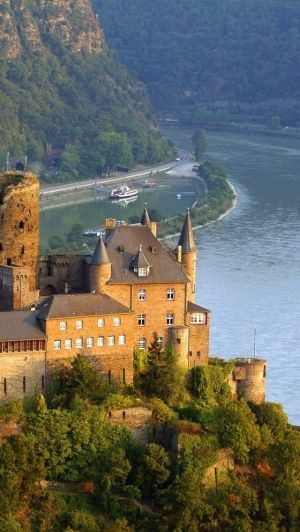 But in the 1890s an American millionaire bought the property from the nearby town of Oberwesel and spent a fortune restoring part of the castle to be his family’s summer home. He finished the work in 1914, which explains the brick edifice. Two generations later his heirs sold the castle back to the town. In the 1950s the town fathers converted the brick building into a 24-room luxury hotel and gourmet restaurant. It was a hit. Tourists love the medieval rooms, four-course meals, and walks in the surrounding vineyards. The startling sight of that brick building amid the ancient ruins and the changes that it brought made me consider that all of us have to change our purpose in life from time to time, especially after a disaster. The castle was originally built to defend the town against invaders. But, centuries later a new purpose was required. The wars were over. The nation of Germany defended the village. Now they needed revenue. It seems to me that most of us are like that old castle. We start off with one aim, but end up with another. Sometimes the change is a natural progression of events, like your children leaving home or your elderly parents passing away. In those cases we have time to prepare ourselves, because we can see the shift coming. However, sometimes a catastrophic event that changes our course does not seem natural at all. We have little warning, if any. A company from which you expected to retire can suddenly shut their doors and lay off everyone. An accident or illness can keep you from walking again or take away the life of someone you dearly love. A divorce can wreck your finances and take away your own children. It happens suddenly and it causes us to either change our life’s purpose (with God’s help) or crumble in despair. If we do not seek God’s guidance we can feel devastated. This is true even in Christian ministry and among lay volunteers in God’s vineyard. Sometimes it is the result our own on sin. Which is why the Apostle John wrote: If we confess our sins, he is faithful and just and will forgive us our sins and purify us from all unrighteousness (I John 1:9 NIV). So what do you do if you feel that much of your life has been squandered away and you cannot get it back? What if that call to a certain ministry that God once placed in your heart is no longer an option? Try asking God to give you a new purpose, a new vision of service. And it does not have to be a grand adventure. There are things that the Lord wants done in your home, your office, your school, and your church. He is not through using you. You may find yourself assisting in a ministry that you never considered before. Maybe you are not so sure it fits your skills. But if God has truly called you to this new work, He will prepare you for it and give you the desire to get the job done. If your goals have been crushed, you may feel you cannot accomplish what you thought you would for Christ. But trust Him to do something even better in this new season of faith. As Paul told the Corinthians, Therefore, if anyone is in Christ he is a new creation; the old has gone, the new has come (2 Corinthians 5:17 NIV). Read 801 times	| Like this? Tweet it to your followers!